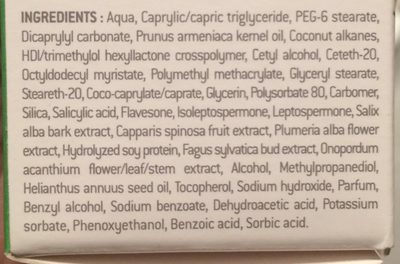 Aqua, Caprylic/capric triglyceride, PEG-6 stearate, Dicaprylyl carbonate, Prunus armeniaca kemel oil, Coconut alkanes, HDl/trimethylol hexyllactone crosspolymer, Cetyl alcohol, Ceteth-20, Octyldodecyl myristate, Polgmethyl methacryiate, Glyceryl stearate, Steareth-20, Cocoopnglate/caprate, &sFerin, 80, Carborper, Silia, Salicylic acid, Flavesone, Isoleptospermme, Leptospermone, Salix alba bark extract, Capparis spinosa fruit extract, Plumeria alba flower extract, Hydrolyzed sag protein, Fagus ytvatica extract, Onopordum acanthium flower/leaf/stem extract, Alcohol, Methglpropanediol, Helianthus annuus seed oil, Tocopherol, Sodium hydroxide, Parfum, Benzyl alcohol, Sodium benzoate, Dehydroacetic acid, Potassium sorbate, Phenoxyethanol, Benzoic acid, Sorbic acid. Produit ajouté le 17 février 2018 à 00:34:57 CET par kiliweb. Dernière modification de la page produit le 22 mars 2018 à 09:33:26 CET par sebleouf.